With the powerful sounds of the Singing Bowls & Gongs, amplify and awaken your spontaneous creative expressions that already exist inside. 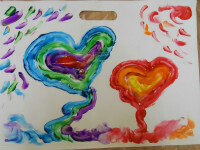 This class provides a unique opportunity to explore and discover your inner creativity with sound, color and fun finger painting! Resonate in imagination, inspiration and insight as the beautiful sounds of the Singing Bowls & Gongs fill the senses. You are the facilitator of your own journey to explore your creative expresssions in a positive, non-judjemental environment that is free from comparison and critique and instead fosters respect, empowerment and Fun! 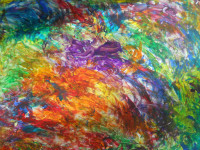 Express your own frequency of spirit thru self-connection and reflection with color and sound. 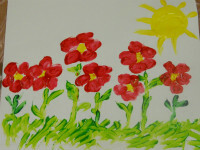 Adults of any age can attend this class - No experience in "Art" is necessary or required. All levels are welcomed. For more information on a Singing Bowl Performance, click here. To see a schedule of Upcoming Concerts and Workshops, click here. In the center of the room, experience the relaxing sounds of the Singing Bowls & Gongs, and around the perimeter of the room (at tables or on the floor) enjoy painting Before and After the beautiful sounds of the Bowls. of creative expression thru the power of sound!